Using an extra screen can be very useful, but extending your screen can be a pain. 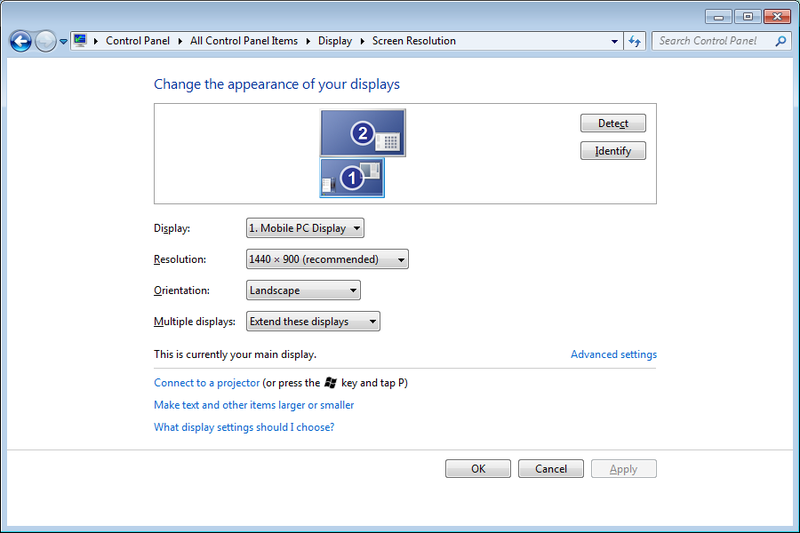 When you extend your screen, by default it will be (virtually) positioned to the right of your primary screen. So when you place your screen to the left or above your primary screen, you would still have to navigate your mouse pointer to the right of the screen to access the display. 3. In the left menu, click "Change display settings". 4. When you have your secondary screen connected, you should see the two screens displayed. 5. You can drag the screens and position them to your preferences. 6. If you now press "Apply" you will be able to navigate your mouse pointer to the other screen by moving it to the side of the screen on which the two screens touch. So, if you position your secondary screen on top of your normal screen and press "Apply", you will be able to access the secondary display by moving your mouse pointer to the top of the screen. If I'm not mistaking, this should work for Windows Server 2008 R2 / Windows 7 / Windows Vista. Awesome, hier zoek ik al 2 maanden achter! Thank you very much.